Tires may be the most important part of having a safe vehicle. Your tires are the only part of the vehicle that touches the roadway. When accelerating from a stop or braking to stop, your tires form the essential contact with the road that allows movement and travel. 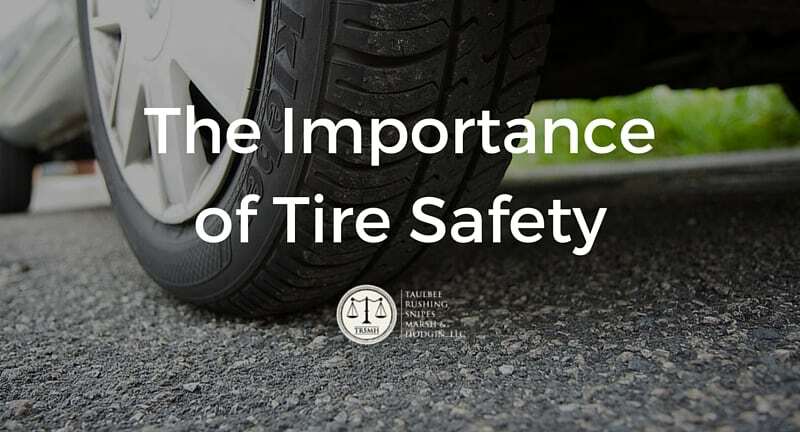 Despite their enormous importance, many drivers do not appreciate tire safety and how to detect unsafe tires. Never operate a vehicle with a improper tread depth. Tread depth serves two important functions. First, tread depth allows tires to “move” water from beneath the tire and allow the tire to grip the roadway during wet weather. Insufficient tread depth makes your vehicle much more likely to hydroplane. Second, tread depth serves a measure of use and overall wear on the tire. As tread depth decreases, the tire has been used more and is more likely to suffer some type of failure. Tires that are run with insufficient tread depth are much more likely to suffer tread separations and other failures while being operated at highway speeds. These type of failures often lead to loss of vehicle control and tragic consequences. Most states, including Georgia, require tires to have a minimum of 2/32 of an inch of tread in order to legally remain in operation on a passenger vehicle and 4/32 of an inch on commercial vehicles. For a passenger vehicle, an easy way to check tire tread is to put a penny in the tread with Lincoln’s head upside down. If you can see the top of Lincoln’s head, it is time to change your tire. Never operate a vehicle on tires with improper or low air pressure. Improperly inflated tires cause the tires to generate excess heat. Over time, excess heat will cause a tire to fail resulting in a blowout or tread separation. You should check tire pressure and tread monthly. Checking your air pressure and tread will not only help with safety, but will also help with fuel consumption. Have your tires rotated, balanced, and aligned whenever you take your vehicle in for an oil change. Tires, like any other rubber product, have a limited service life regardless of tread depth and use. This fact has been long-acknowledged by automakers and some tire manufacturers. Yet, the public, and even tire retailers and service technicians, know little about the dangers of aged tires. Aged tires are often unsuspectingly put into service after having served as a spare, stored in garages or warehouses, re-sold on the used tire market or are simply used on a vehicle that is infrequently driven. In many instances these tires show no visible sign of deterioration, and absent any visible indicators, tires with adequate tread depth are likely to be put into service regardless of age. Simply stated, over time tire rubber reacts with oxygen and its elasticity and resistance to failure decreases. The sidewall of your tire contains a DOT number. This number allows you to determine the manufacture date of your tire. As a user, you should be very concerned and replace any tire that is over five or six years old. Never operate a vehicle with tires that have cords, steel or cloth that is exposed from beneath the tread or rubber sidewalls. Over the past few years, our firm has handled numerous cases involving tire failures. The tire failures that led to these cases involved bad design, poor manufacture and assembly, and problems with the formula for making the different rubber components used in tires. We have handled multiple cases against Michelin/Uniroyal, Bridgestone/Firestone, Continental and Cooper. If you or someone you know has been injured as a result of a defective tire or product, contact our office for a free consultation. Daniel B. Snipes is a partner at Taulbee, Rushing, Snipes, Marsh and Hodgin, LLC. A graduate of the University of Georgia and the University of Georgia School of Law, Daniel is a litigator who focuses on the areas of Medical Malpractice, Motor Vehicle Accidents, Motor Vehicle Defects, Personal Injury – Plaintiff, Products Liability Law, Recreational Products, Trucking and Wrongful Death.